Ugh. This is just sad, but I feel like I have to post things that don’t go as well because let’s face it, we all make things that just don’t go the way we hope they will so why not compare battle stories? 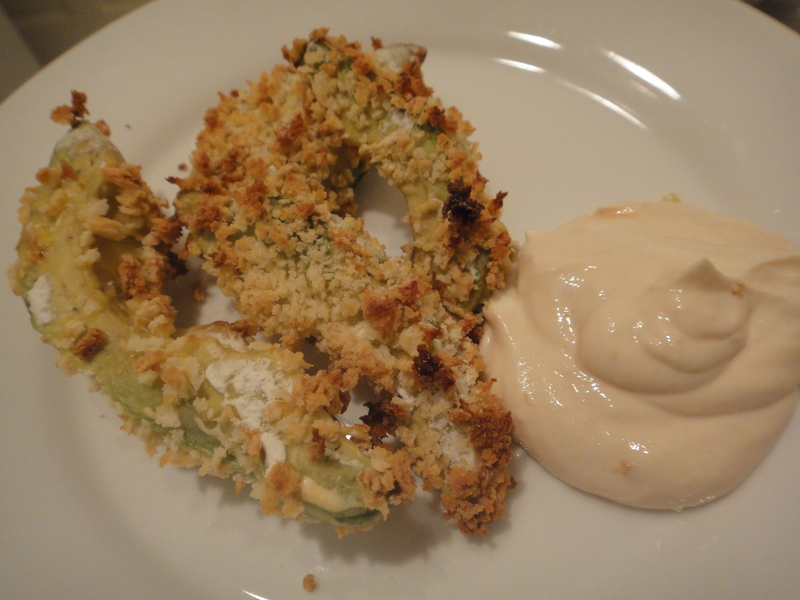 Here’s one of my recent fails…Baked Avocado Fries. I’ve been hearing about avocado fries for the last few months and I’ve been intrigued. Really intrigued. Everyone’s been raving. It sounds so amazing…avocados…fries. YUM. Well, I try not to fry my food because my body just doesn’t handle that very well, so I was pretty excited when I found a recipe for baked avocado fries that claimed to be as good as their fried counterpart. Not so much (assuming these taste differently than the fried ones). Let me defend this recipe a bit by saying the avocados I had were as hard as rocks (which is blowing my mind still). I had these things in my fridge for weeks and figured they were probably on the back side of good. WRONG. They were not even close to ripe. I had to work so hard to get the darn things out of their skin…and let’s not even talk about trying to remove the pits! Annoying. Their “raw” state is what probably led me to my qualm with this recipe…they had no flavor. Bummmmmmer. I still want to try to fried version of these guys though because I love avocados. Since there’s so much hoopla around the fried version, I feel like I have to try it before I form an official opinion. I’m not jumping on this train. I hate to think of avocados being sacrificed! Sorry this didn’t work out for you. maybe try this recipe where you dont put coating on it just seasoning and let it form its own skin? I love avacados and would have been so bummed with the same results as you had. id have had to blend them into some puree of sorts to create a dip from . Thanks for the info! I’ll have to give that a try! And you know, the dip idea would have been good had I sucked it up and quit whining over my failure :) Noted for next time!! p.s. I have only had success with HAAS avacados in recipes. A green market talked me into buying the large green ones, said if you shake it and hear the pit rattle its ripe. NOPE they were hard like you said and had a bitter bite to them. If I thought the baking would remove the bite from them I might try the large green ones as fries, but will use HAAS initially. I get mine when they barely give when squeezed with a good bit of pressure from finger tips, and then I use them immediately. I finally got around to cooking these. OMG they are delish! I used Haas avacatdos, onion salt, white pepper powdered, garlic and cayenne. The house smells wonderful~ I cheated and ate two really small thin pieces that were already getting crispy, I swear it reminded me of Steak fries~!! cant wait for these to finish cooking! all I did was sprinkle from a spoon over the slices. then flip and finish cooking. LOL theres no T in avacado and after I flipped them I sprinkled them again with the seasoning. Thanks for the update – I’ll give it a try!